With the forecast for the weekend decidedly chilly and the river still very low and clear, it was going to be hard today and a good draw would be essential. 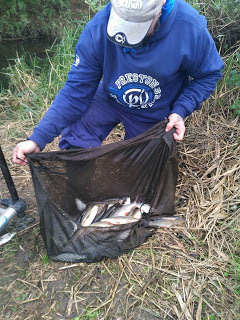 I got to the pub and we were down a few anglers this week with some of the regulars on holiday or working. 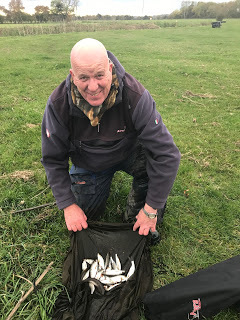 Rob had pegged Redbridge, Isle Brewers and above Hambridge for the first time this series, the landlord Steve picked the golden balls and this week they were pegs 108 and 129, both very capable of winning. When it was time to draw I really fancied a crack at the aforementioned 108 or 120 but Karl and Rich pulled those out before I got to the bucket. I ended up on H5 which is the first bend above Hambridge, it’s one of the few swims I’ve never fished and I was looking forward to it as it wins its fair share of matches although I was a little concerned it might be a little early for it. Rob was on H4 by the bridge with Steve P above me and when we got to the river, it had been recently dredged and looked really nice. Also, after a cold start, the sun was out and it was turning into a lovely day. We got to our pegs and I managed to get my box nice and low to the water and when Steve shouted down that he’d just seen a good fish roll on the bend above him, I said to Rob that I thought it would fish really well today (famous last words!). 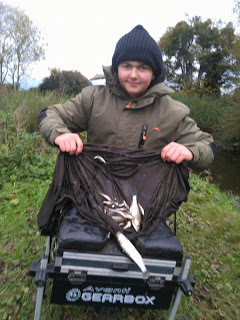 I was struggling a little bit to get set up in time as all my rigs were either miles too deep or not quite deep enough, I settled on a 1 gram Drennan Trio which I hadn’t used for a while and put a new hooklength on it. Casters, maggots and Bait-Tech Super Seed Hemp were on the side tray. Rob shouted the all in and I started at 8.5 metres down the middle but the float just sat there as there was no flow at all which was a tad worrying! I was even more worried when I hadn’t had a bite after 15 minutes as I was expecting to catch small fish quite quickly. I asked Rob and Steve how they were doing and they still hadn’t caught either. I tried maggot to see if I could get a minnow to avoid the blank but only succeeded in getting snagged up and there was obviously still a fair bit of weed about. I started feeding a new line down the peg at 8.5 metres but after an hour I still hadn’t had a sniff and it was time for a walk. 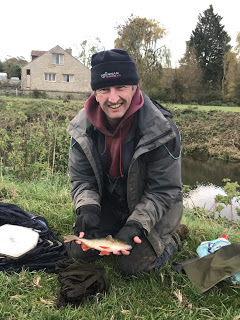 Rob hadn’t caught so I walked up to see Steve and as soon as I saw the big grin on his face, I knew he had a fish and he told me he’d caught a big perch around 2lb on caster and he’d missed a couple of bites on worm as well. Feeling a bit more optimistic as there were obviously some fish willing to feed, I headed back to my peg with the intention of sitting it out hoping for a bonus or two. I quickly popped down to let Rob know that Steve had caught and as I walked away he swung in a tiny perch to leave me as the only blanker (and no that’s not a spelling mistake!). I sat back on my box with renewed enthusiasm but after an hour or so of swapping between my two lines and drinking coffee I was still fishless so with bait tin in hand I decided to see if I could scrounge a couple of worms off one of my neighbours. 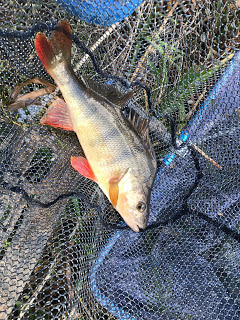 As I sat down with Steve he told me he’d had another perch, this one about 12oz, he only had a few worms but very kindly let me nick a few. I walked back down to see Rob and he’d added a small roach to his tally, I asked if he had any worms and he let me have a handful – cheers mate. Nipping the head of a dendra, I shipped back out and surely no self respecting perch could resist this wriggling morsel of goodness! After a further hour, the worm was looking as bored as I was and I just could not buy a bite. Steve arrived behind me and said he hadn’t had anymore but Rob was now getting the odd chublet and roach and I was looking at a DNW which wouldn’t do my league any good whatsoever. With around an hour to, I tried a single red maggot and the float settled, dipped and then slid under, I lifted the pole and there was life on the end! I shipped back carefully and swung in a small roach that I nearly kissed and I’d avoided the blank. No more followed but at least I knew there were some fish about, I stuck another couple of sections on and went right down the peg and just as I was about to fire some feed out, the float went again and I had another little roach, another followed on the next chuck and then I hooked a fish that actually pulled some number five elastic out and I netted a lovely 12oz perch. A quick look at my watch and there was still 40 minutes left, maybe I could still pull this out of the bag! 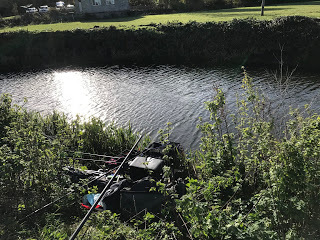 Next put in, as the float settled, it slid along the surface and another small fish was on but it came off as I shipped back and that killed it – bugger! 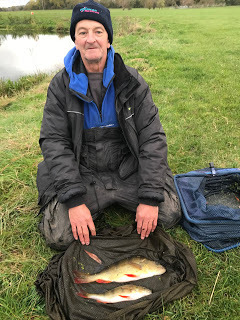 Steve shouted down that he’d just been done by a big fish and I was still hopeful that a couple of bonus fish might show in the last half an hour. I was fishing down the peg when a fish rolled in front of me and that was the first one that had showed itself all day. I took a couple of sections off and went back to where I’d been feeding all day but no more indications until just before the end when I managed a small roach. My final tally was four small roach and that perch for a pound or so. As I had the scales, I packed up and went down to weigh Rob in first, he’d caught quite a few in the end and weighed 1lb 6oz, I was next and my fish went 1lb 2oz and then it was Steve’s turn, out of interest we weighed the big perch and the needle stopped just shy of 2lb, a lovely fish but as is very often the case with perch they look an awful lot bigger than they actually are. Along with his other perch, he weighed 2lb 11oz and I said that lost fish might be costly today. So Karl had done it and won the match and golden ball, well done mate and it just goes to show it’s always worth staying to the end as he caught all his fish in the last hour. 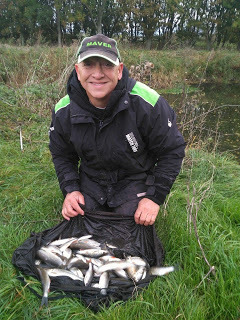 So considering how low and clear the river is at the moment, it’s fished quite well and if we ever get any rain, I think you will see some big weights, I think there’s a lot of chub at Redbridge and it may sound strange given we’d struggled at Hambridge but I reckon there’s a lot of fish there and I think it’ll fish it’s head off later in the year or with some colour on it.